Hey Fam! If you haven't had the chance to search the hashtag #WeAreNigerianCreatives, then what you doin?? 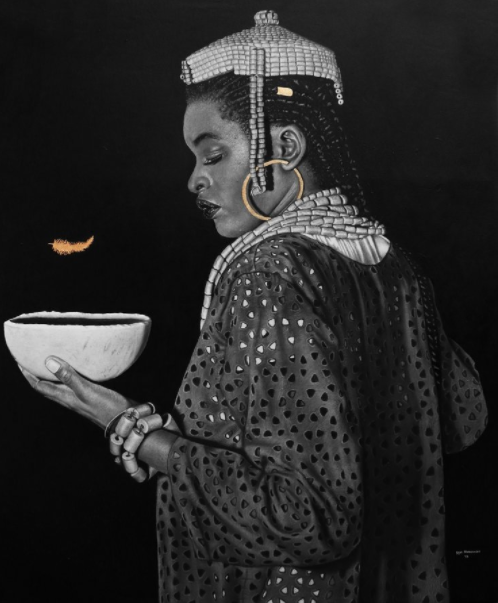 While you're looking, you might come across the incredible works of Nigerian Hyperrealist artist, Ken Nwadiogbu. What's hyperrealism you ask? Well, it's basically when an artist replicates a segment of reality, usually a photo, through pencil, paint, ink, etc. I admire hyperrealists, so as soon as I saw Ken's work, I knew I had to reach out to him for an interview. Ken is very humble and down to earth, which was shocking since his pieces are the opposite. His breathtaking drawings are all done in pencil. If you can only imagine the patience it takes to even finish a corner of the paper! Sheesh. Check out my conversation with Ken below. He drops gems about society's take on hyperrealism. Also don't forget to follow him on twitter @kennwadiogbu and visit his website www.kennwadiogbu.com. How did you get started with art? And what drew you to the hyperrealistic style? During my diploma days, I met a friend of mine drawing the Dean of the University of Lagos at that time. Instantly I knew there was more to art than doodles on my note books, hence, I began to research. Research turned to obsession. Obsession turned to love. What is your process like? Do you take the photos yourself and replicate them? Why do you prefer pencil as opposed to colored utensils? After the brainstorming of the concept, I get a model and take a picture of him/her. The essence of the picture is not to replicate them but to use them as a guideline to create even something much more real than just a photograph, as well as add more elements to make it a lot figurative. The art world is full of paintings, so I'm practically trying to burst into that world with a black and white feel, to give an essence to pencil, rather than it just being a skeletal form before the creation of a painting. What is your opinion on the common perspective that hyperrealism/photorealism isn't really art? Hahahaha. Everything is art. Hyperrealism can be a stretch to becoming a skillful and talented form of art, but that doesn't make it "not art". If anything, I think it adds more value to whatever narrative or presence the artwork should possess. How long does it take for you to finish a piece? Roughly 3 weeks to a month. My works are a bit scarce. What has been the hardest image that you have recreated? And why? I think it should be Lost Consciousness I. The reason for this is because of the presence of the plastic bag; something different from the regular face. Where do you draw your inspiration? And how do you know which image to choose? I believe the society always speaks. It says A and B. And it's our job to listen. Not only listen, but to reply. That's how I get inspired. I listen. I hear. I watch. I perceive. Then I reply.